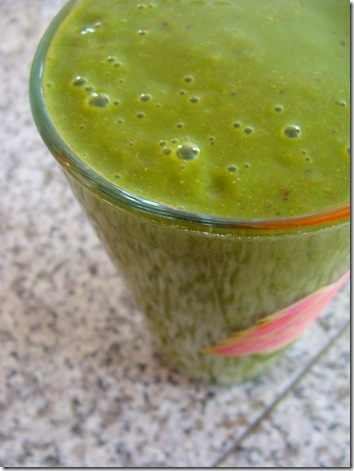 Drinking your greens has to be the most popular way to incorporate green, leafy goodness. Nicknamed the Green Monster, I jumped on the blending bandwagon quite some time ago. I continue to receive great questions about my concoctions and decided to dedicate a post to these wonderful inventions. Why do you drink them? I drink them because they taste AMAZING! They are very soothing on my tummy and are easily digestible. I usually have mine for breakfast as I make them very thick and filling. But I will also make them for an afternoon pick-me-up OR a post workout snack. It’s a wonderful drink to make if you know you are hungry but just aren’t hungry for anything. But they are also contain amazing nutrients. Most of us do not take in the recommended amount of veggies or fruit per day and this “treat” is a a sure fire way to get in AT LEAST 3 servings, if not more. It calms cravings, energizes you and makes you feel wonderful, inside and out! The reason they are called Green Monsters is because they are green. But in order for them to become green you need to add some green, leafy goodness. My all time favorite is organic baby spinach. I use kale if I need to use it up and you can use any other kind of greens – chard, collard greens, wheat grass or lettuce. I use 2-3 HUGE handfuls of spinach per drink. The reason I love adding spinach above the rest is because you cannot taste it. Don’t get me wrong, I love the taste of spinach, kale and other greens… but just not in my smoothie. And for those of you that do not like the taste of spinach, try a GM! I PROMISE you will not taste the spinach! I also always use almond milk as my base, usually 8 oz. A nice amount of flax meal goes into it, along with a banana. Then I go from there! I have experimented and have come up with some real winners… AND some real losers! I have noticed a huge amount of powder’s and filling’s that other bloggers use: maca powder, xanthium gum, guar gum, protein powder’s… I have yet to try any of these so I cannot give any feed back. I guess I like mine simple and “clean”. I also love making a berry drink with blueberries, strawberries and raspberries, along with vanilla almond milk. I am fan of my GM’s being thick and COLD. If I am using fresh fruit I will add ice to chill it down and thicken it up. It is also a great way for your kids to get their greens in! Jordan LOVES GM’s and drinks them daily with me. Do you blend or juice? I have seen you do both. I always blend my GM’s. If I am making a juice drink it will always come out red as I love adding beets. I do use greens when I juice, though. But for some reason I feel that I am wasting spinach when I do this. Maybe it’s my juicer but big chunks of leaves are always in the waste bucket. So I typically save them for my GM’s. – Someone had asked me why I add flax meal and if it sank to the bottom. I ad flax meal because I am a huge fan of flax and its health benefits. Flax contains a huge amount of Omega-3 fats that are heart healthy and helps the digestive system. I like to use flax meal instead of whole flax seeds as the seeds never seem to properly grind, and stay whole. While there is nothing wrong with this, I just didn’t care for whole seeds in my smoothies. I have never had a problem with the flax meal settling to the bottom, but like I mentioned above, I drink mine thick. 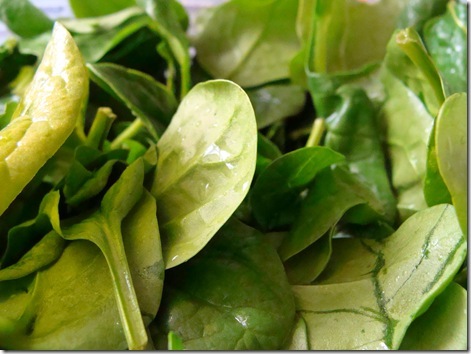 – PLEASE prewash your fresh produce, including pre-washed spinach. Do not trust the packaging! I have found bits of things in my spinach and the package clearly stated it was Pre Washed. This entry was posted in green monster. Bookmark the permalink. 14 Responses to Bring on the Green! I'm starting to incorporate GM's back into my diet starting tomorrow! It's already made and in the fridge ready for me to drink! This looks awesome! Thanks for replying on twitter! Love the GM, we do it daily, it really is a great way to get the kids to consume a large variety of greens. A few frozen berries makes them more appetizing to the kids:) I do not add any powders to mine either, just real food. Oh yeah, been drinking a lot of green monsters lately, at least one a day. Fun throwing in veggies that need to be used up. I love these too!! I got through stages though. I had one the other day and just didnt love it… but I added some powder to it, and wasn't impressed!! Fantastic post though!! I'm a huge fan of the green smoothies, even though it makes my boyfriend gag to watch me drink them! I started making these almost every morning after finding your blog. Super delicious and make me feel awesome. It's about the only way I can get my kid to eat something green. Thanks! I LOVE my GM's!! I tell anyone and everyone about them and can attest to all that you CANNOT taste the spinach! I would be the 1st person to get grossed out at the thought but it is so good! I add at least 3 cups of baby spinach to each one and 2 tbsp of ground flax too. Frozen berries make it so cold and tasty and actually a little purple too!Thanks Tash, great post! !